Included below are homes for sale in Mission Bay San Diego. If you would like more information on any of these Mission Bay real estate listings, just click the "Request More Information" button when viewing the details of that property. We can provide you with disclosures, past sales history, dates and prices of homes recently sold nearby, and more. And, if you haven't already, be sure to register for a free account so that you can receive email alerts whenever new Mission Bay houses come on the market. Listing information last updated on 4/26/2019 9:15 AM. Crown Point is located on the peninsula that runs through Mission Bay. Crown Point is an excellent location for biking and walking to parks, beaches, restaurants, and the boardwalk.South of Pacific Beach, Mission Bay faces the east. It is a saltwater bay or lagoon where wakeboarding, jet skiing, sailing, and camping are popular. Also part of Mission Bay Park, largest man-made aquatic park in the US, 46% land and 54% water. Mission Bay Park the ninth largest municipally-owned park in the United States. 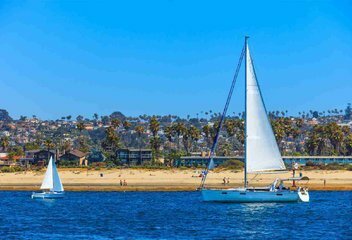 Located on the west side of the bay, Mission Bay Yacht Club holds sailing races throughout the year and has produces national sailing champions. Within Mission Bay is Fiesta Island is a popular location for charity walks and runs, bicycle races, time trials and other special events, and home of the annual Over-the-line tournament. The H1 Unlimited circuit is a hydroplane boat race annually held called the Bayfair Cup.